Can A Painting Inspire Dinner? and the brush strokes so full of energy. The whole scene sings with the colorful island vibes that the Caribbean is known for. 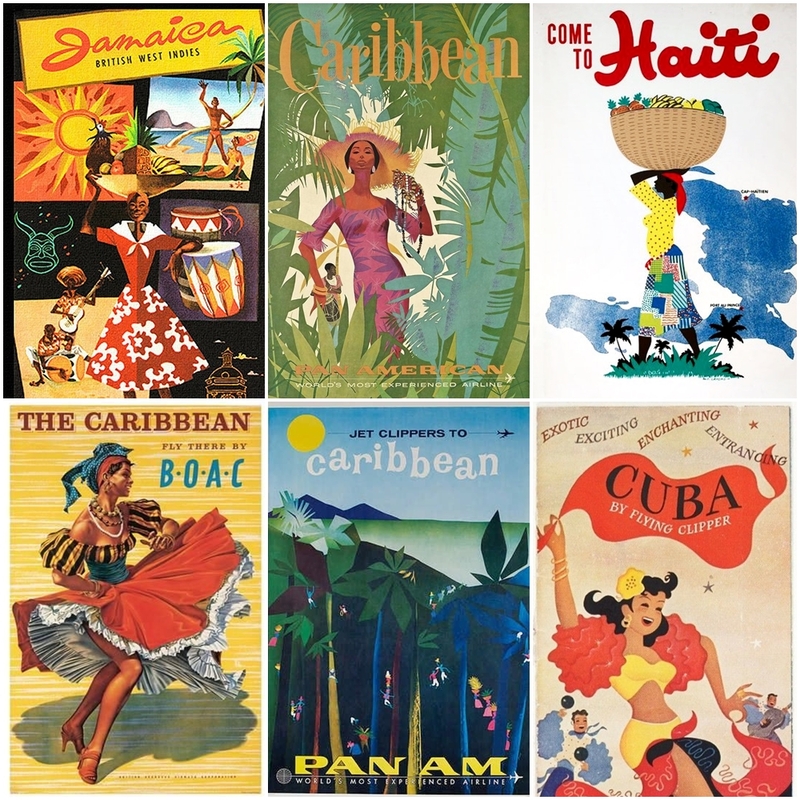 Immediately it made me think of the 1960’s cookbook in the shop – The Art of Caribbean Cookery – another midcentury treasure that also sings songs of colorful island life. 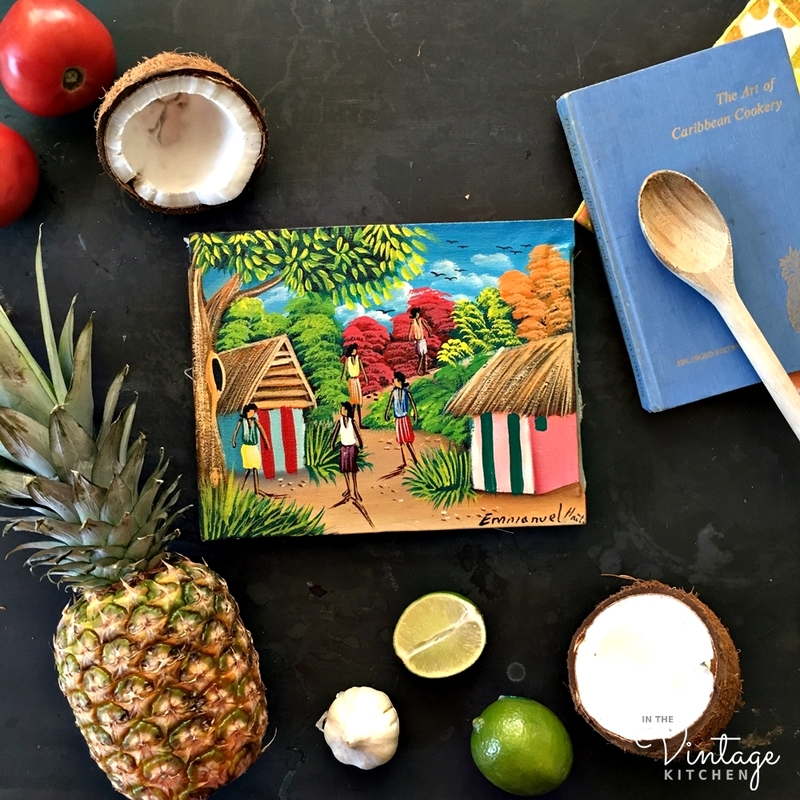 The painting hails from Haiti, just one of the 28 islands that make up the Caribbean, but the cookbook, written by Carmen Aboy Valldejuli, includes all the cultural influences of all the islands… Puerto Rico, Cuba, the Dominican Republic, Haiti, Jamaica, etc. Carmen is Puerto Rican herself and grew up in a traditional island household of the 1920’s, a world where servants cooked and children were not encouraged to help. 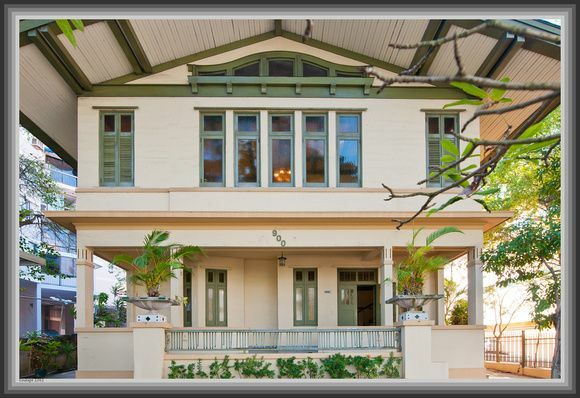 This is the house as it appears today, bright and pretty. Photo via pinterest. But things changed once she met her husband, Luis, in the late 1930’s. 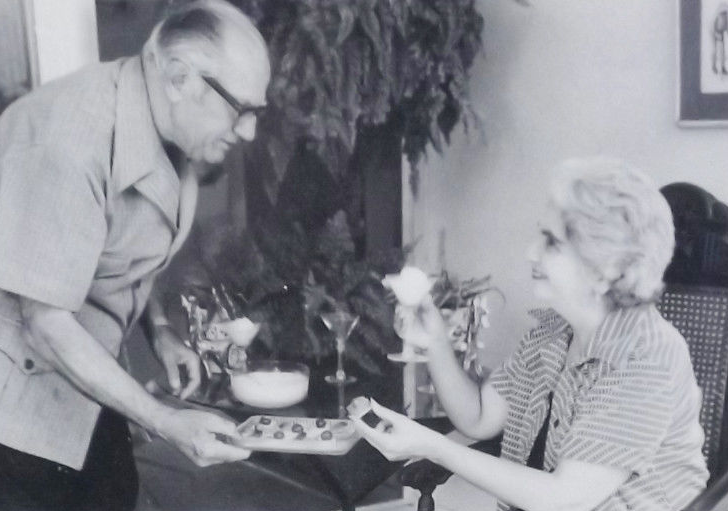 Luis was an unashamed food zealot – an eater, a cooker, and a recipe collector. He had a day job in engineering but on nights and weekends, he and Carmen crafted their time together around the glorious subject of food. Bolstered by one another’s support and enthusiasm, the two indulged their culinary interests in a fun and curious way, which turned out to be the only encouragement Carmen needed to realize her life-long passion for cooking. What used to be forbidden was now a freedom. Carmen and Luis – the Carribean’s cooking dynamite team. Luis was always in charge of the cocktails. Carmen took on this new interest with gusto. She and Luis dined their way through the islands, exploring offerings at family tables, fancy restaurants and everything in between. They traipsed around sugar plantations and farms and fruit groves. They listened and questioned and learned from everyone they encountered about cooking methods and techniques, about family stories and recipes passed down through generations. After each escapade, they’d return home to their own kitchen in Puerto Rico ready to dissect what they had discovered. 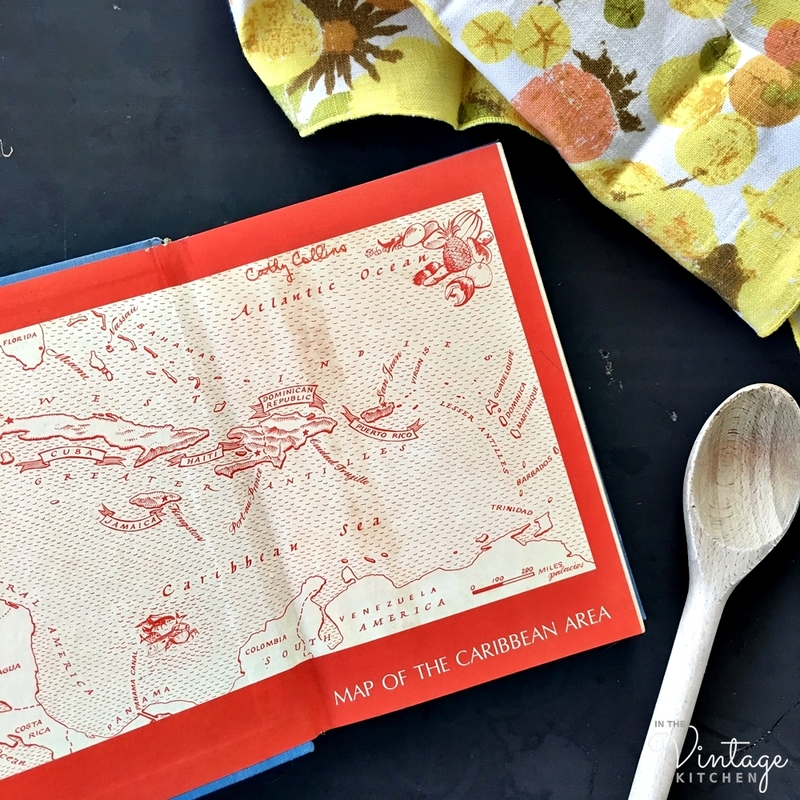 As Carmen learned first hand, cooking in the Caribbean was a vast wonderland of food, flavor, and influence from other countries far from the tropics. 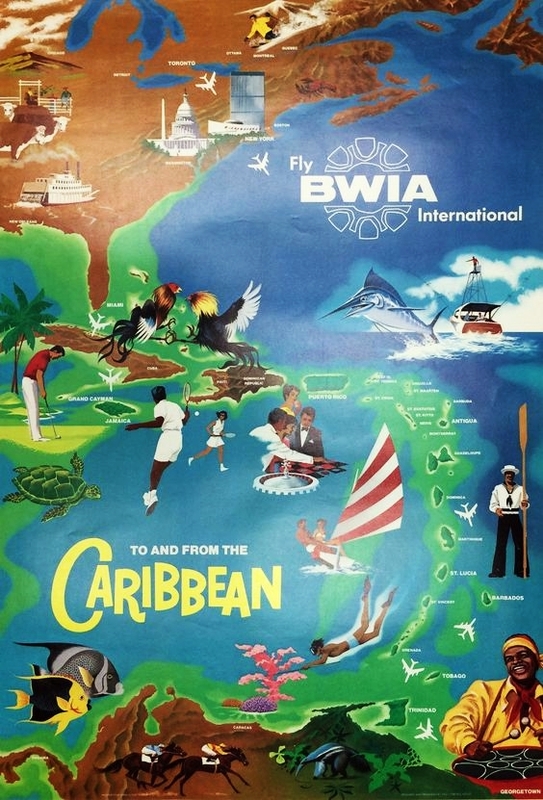 Vintage Caribbean travel posters from the 1950s and 1960s. Floating between the Gulf Of Mexico and the Atlantic Ocean, with the United States, Mexico and South America acting as surrounding neighbors, the Caribbean is made up of an incredibly diverse population – an exotic tribe of people from Europe, Africa, Mexico, the Mediterranean coast, the United States and the U.K. Originally there were the first inhabitants, the Arawak Indians, but then came the British, French, Dutch, Danish, and Spanish settlers along with slaves from Africa who worked the sugar plantations and ex-pats from America looking for escapism. 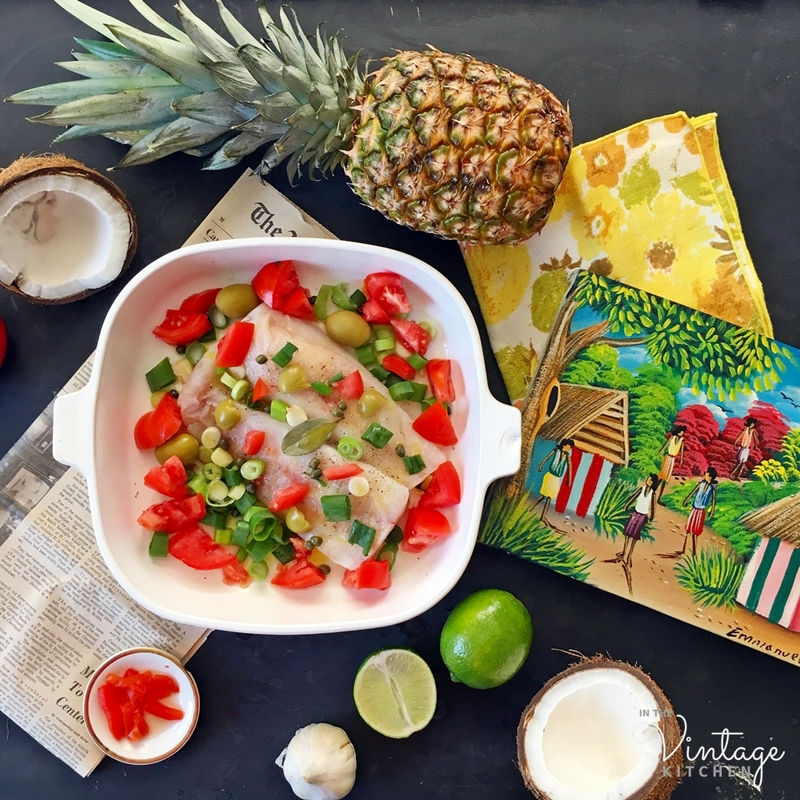 All these cultural influences grew diversity on the islands and greatly layered the cuisine of the Caribbean, making it not just one type of food, but a blend of many nationalities. In the painting, there is no sign of food, but its very essence pulls your imagination towards sandy beaches, tropical drinks, coconuts, rum, pineapple, papayas. Carmen is quick to explain that cooking in the Caribbean is not all “roast pig and ritual,” that food varies from island to island, built upon six centuries of history and the cohabitation of many cultures. It was with that in mind that I chose, a recipe from Carmen’s cookbook that is an authentic Carribean dish marinated in generations of foreign influence. For today’s post, we are making a recipe that combines elements of Spain with two Caribbean staples – olives and capers. The dish is called Pescado Dorado or Golden Fish and it is a lovely meal to wrap up the end of summer with since it shines best with garden tomatoes fresh off the vine. Carmen’s recipe recommended using a whole fish but I used cod filets instead since I couldn’t find a whole tropical-looking fish at our neighborhood market. The recipe serves 8 but if you don’t want to make a big dinner out of it, simply cut all the ingredient measurements in half and you’ll wind up with a smaller serving for four. If using a whole fish, wash it inside and out. Ignore this step if using fish filets. Cut 2 slight gashes on both sides of the fish or filets. Place the fish in a baking dish. Squeeze the juice of the limes over the fish and sprinkle with salt and pepper. 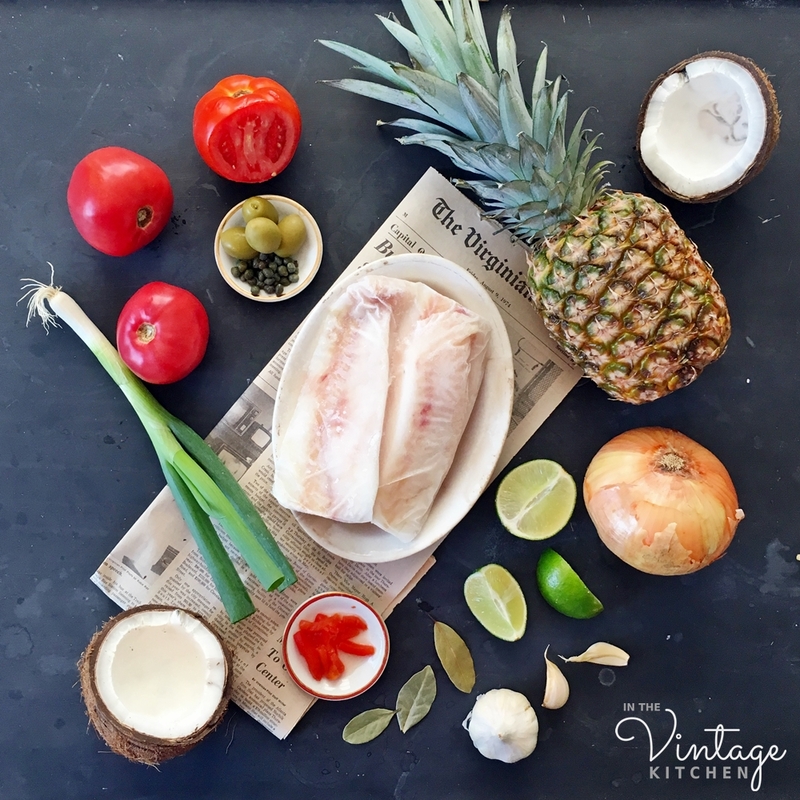 Arrange the rest of the ingredients from the onions to the tomatoes on top and around the sides of the fish. Preheat oven temperature to 550 degrees. * Bake fish for 15 minutes. Lower temperature to 425 degrees and bake for 25 minutes longer, basting fish occasionally. Heat pimientos and serve as a garnish on top of fish. *A note on cooking time and temp – In 1963, Carmen’s oven reached 550 degrees. In 2018, the hottest my oven gets is 525 degrees. I cooked the fish at 525 degrees for the first 15 minutes and then reduced it to 425 degrees and cooked it for the remaining time with no problems. What emerged from the oven, after it was done baking, was a flaky cloud of codfish that was swimming in a salty citrus sea. To say that this dish was anything but delicious would be an understatement. Sometimes fish dishes are very light and leave you still feeling hungry, but this one is robust in flavor and is filling enough on its own. 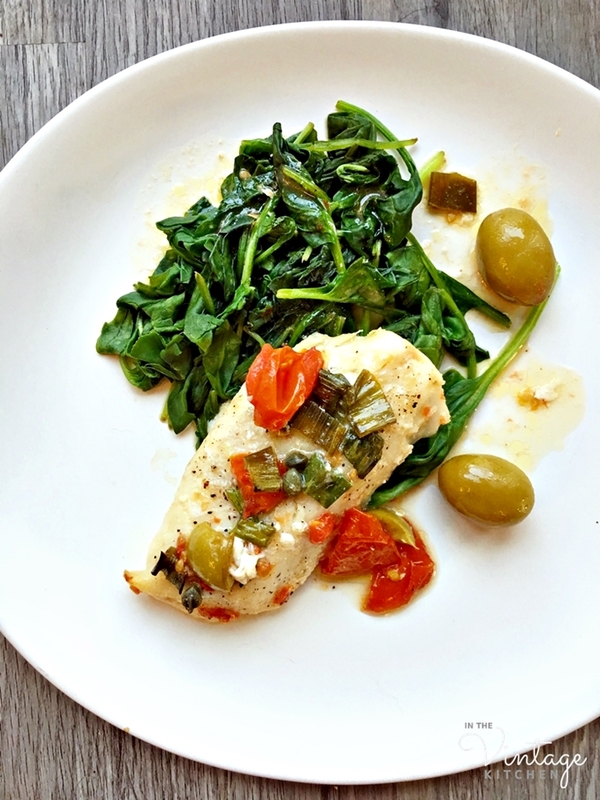 I paired this fish dish with a handful of sauteed spinach and garlic but rice would also work or a side salad. Dessert was kept equally simple with a fresh fruit board that included pineapple, mango, papaya and fresh coconut. and instantly loved it. Further discovery led to his Calypso album, a bestseller full of Caribbean folk songs that was released in 1956. In its first year, this album sold a million copies landing Harry on top music charts and making him an international superstar. If you are unfamiliar with his work, the link below is the full album of his 1976 record The King of Calypso, which packs all of his most famous hits in one album including the Jamician folk song Day-O about dock workers loading banana boats and the island love song, Jamaica Farewell. Between the three – painting, music, and food – this dinner felt like a mini island vacation all in itself. If you find that your summer has come and gone and left you without the chance to relax as much as you wished, try spending the evening with Carmen and Harry and Emmanuel (the painter) and see if your spirit can’t be soothed by a little slice of creative paradise. A glass of rum helps spread the cheer too. Incidentally, I tried to find out more about my muse for this post, the artist named Emmanuel who painted the Haitian landscape that started all this to begin with. But he was elusive. As it turns out, there are LOTS of painters named Emmanuel in the Caribbean. That’s okay, though, it doesn’t matter that he can’t be tracked down further. Muses aren’t exactly known for their easy accessibility. Bob Dylan believed that the highest purpose of art was to inspire. 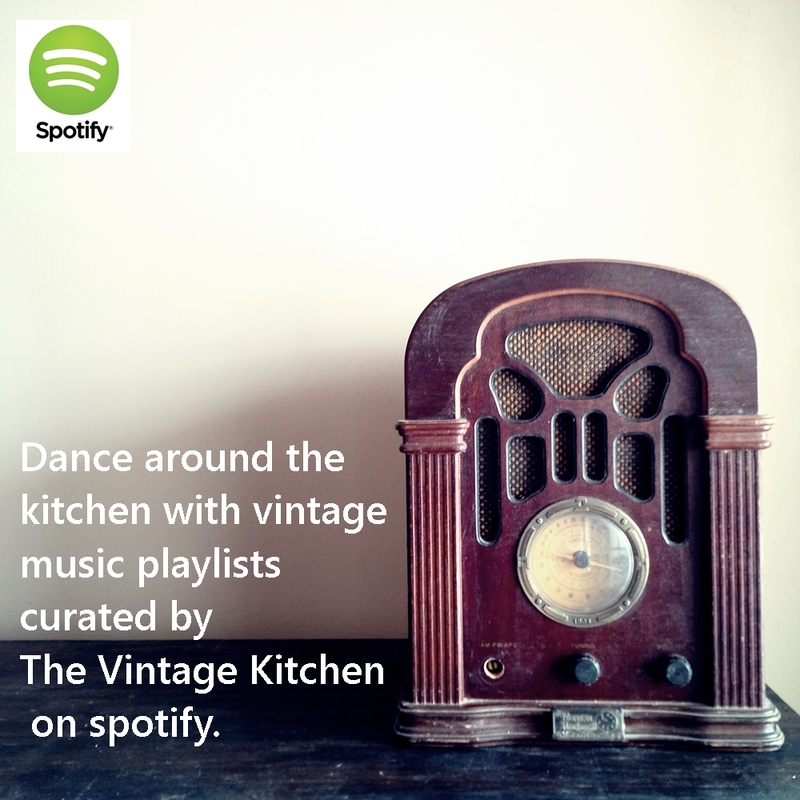 In that case, Emmanuel certainly fulfilled his role, at least during dinner time in the Vintage Kitchen. 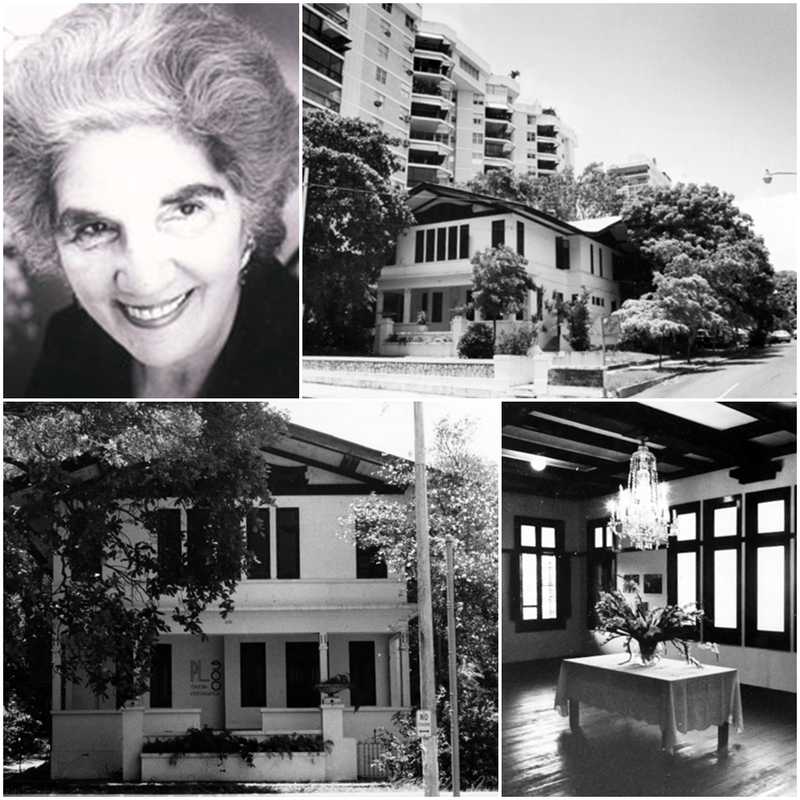 As for Carmen, she went on to become an expert, the expert, of Caribbean cuisine, publishing several cookbooks throughout her life. Even though she died in 2005, she is still regarded as the classic authority on Caribbean island cuisine. So as you can see, a painting can indeed inspire dinner and also a little more. Hope this post inspires you just as much. Cheers to soaking up the essence of the islands without ever leaving home. 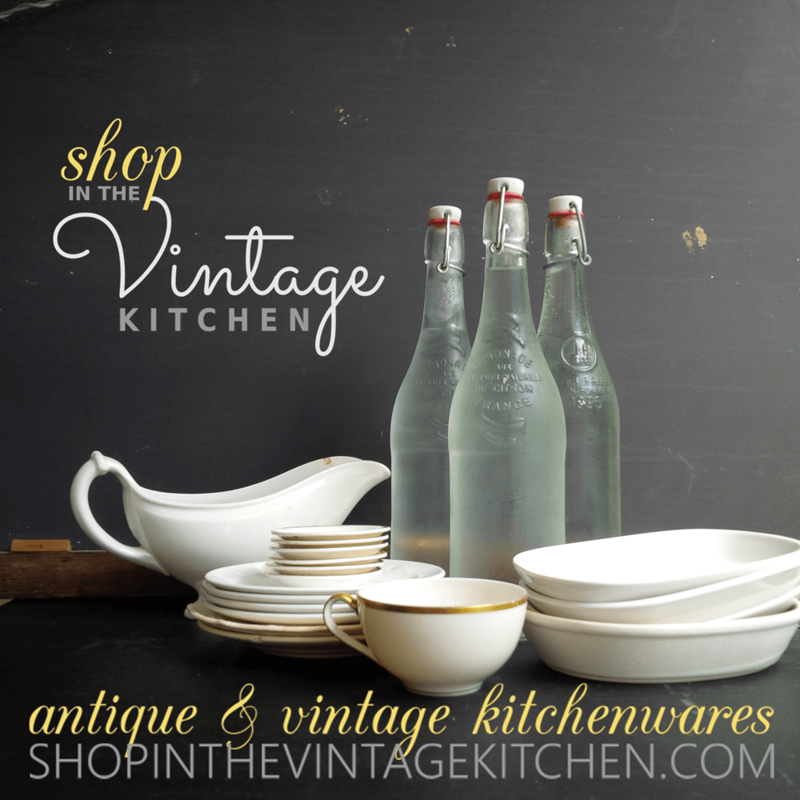 Find the cookbook and the painting in the shop here and here. Find Harry Belafonte’s music on our Vintage Caribbean Vibes Spotify playlist here. Next Exciting News! It’s Giveaway Time! Love the painting! I’m drawn to such colorful works also. And the fish recipe looks amazing. I very much enjoyed this post. I generally read yours but I’m not much for commenting. Just wanted you to know how much I enjoy your blog. Thank you so much for popping in to say hello! Your kind words made my day! I’m so glad you are enjoying the posts, this one in particular. It is always nice to chat with a fellow art lover. Hope you have a chance to try the fish dish – it is very easy and fast to make. And if you were up for even more experiment, this recipe would also be lovely with chicken if you wanted to swap out the fish. It is all easy breezy carefree cooking as is fitting for the easy breezy islands:) Thanks again for popping in. So glad we had a moment to chat. I was sure that I commented on this article weeks ago! 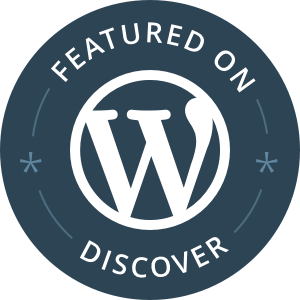 Now I see that there is now comment, so WordPress must have deleted it. Anyway, I wanted to tell you that it is a lovely article. The dish looks delicious, and it is so clever to take inspiration from a painting for food! In the phantom comment, I invited you to join “The Second Annual Great Breening Blogathon.” This blogathon, which began yesterday and goes through the 17th, is a celebration of the Code, its Era, and its enforcer, Joseph I. Breen. We are using this blogathon to honor Joseph Breen on his 130th birthday, which would have been on October 14. However, we are extending the blogathon to October 17 to celebrate the second anniversary of PEPS, which was founded on October 17, 2016. You can participate by breening a film that is not from the Breen Era (1934-1954) or by analyzing a Code films. You can also discuss an aspect of the Code, its influence on Hollywood, or Mr. Breen himself. You can find out more and join here: https://pureentertainmentpreservationsociety.wordpress.com/2018/09/27/announcing-the-second-annual-great-breening-blogathon/. I wondered if I had missed a response from you, but now I see that you never got my invitation. Now, it is so late that I’m sure there is little chance of your participating. If you would care to join, however, we would be so happy to have you! If you post later in the week, that’s fine. We could still include you. Oh thank you so much Tiffany for the invite! How exciting for a new blogathon. I’d love to participate but I’m a little behind in my blogging so I fear I won’t make your Breening blogathon but the Claude Rains one in November sounds exciting. I’m not familiar, I don’t think of any movies of his, other than Casablanca so that will be a fun project to dive into. Thank you so much for the invite and for being in touch. Hope you are having a great start to Autumn!